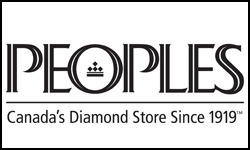 Peoples Jewellers has delivered the best value and knowledge in their exceptional fine jewellery and diamonds for nearly 100 years. Today they are recognized as the top diamond store in Canada. Whether it's a gift for someone special or for yourself, customer satisfaction is guaranteed. Discover the People's difference at CF Fairview Mall.